Legoland employee, Josh Fowler, has turned his grief into an amazing LEGO tribute with 100 Miniland figures chronicling Bowie’s colourful career. The flickr stream has been unveiled today on the first anniversary of the star’s passing. Josh’s builds include iconic Bowie images from 1969 to 2016, and includes nearly every persona and costume from album covers, tours, and music videos. Interesting facts about David Bowie’s life are written next to each picture. You can see all 100 Bowie builds here. 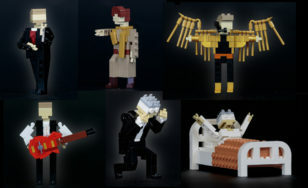 How could I buy the Bowie LEGO bricks?